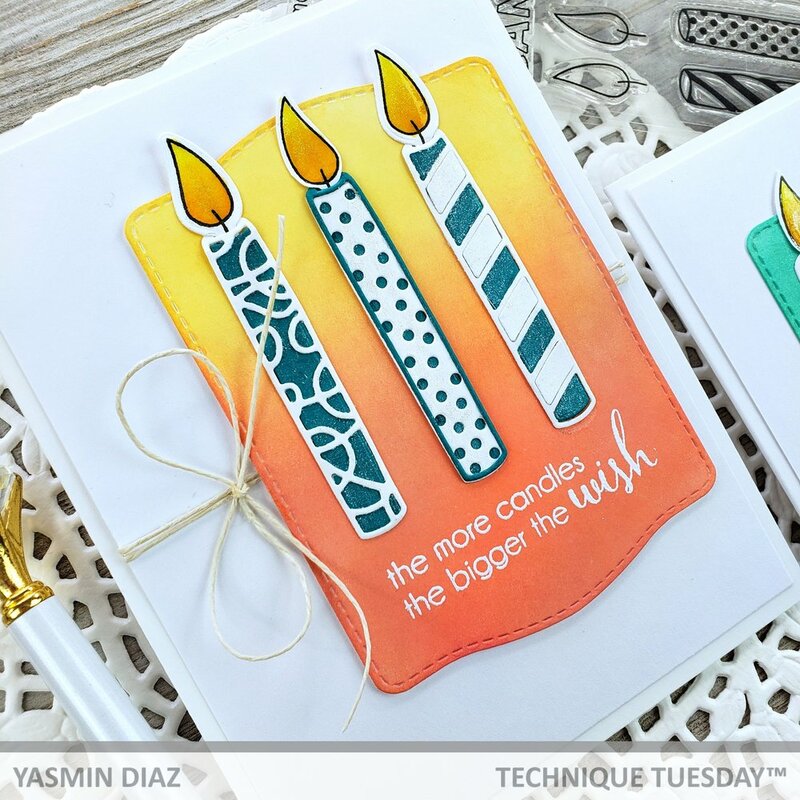 Hi friends, I’m so honored for being part of the Technique Tuesday 2019 Virtual Birthday Celebration! 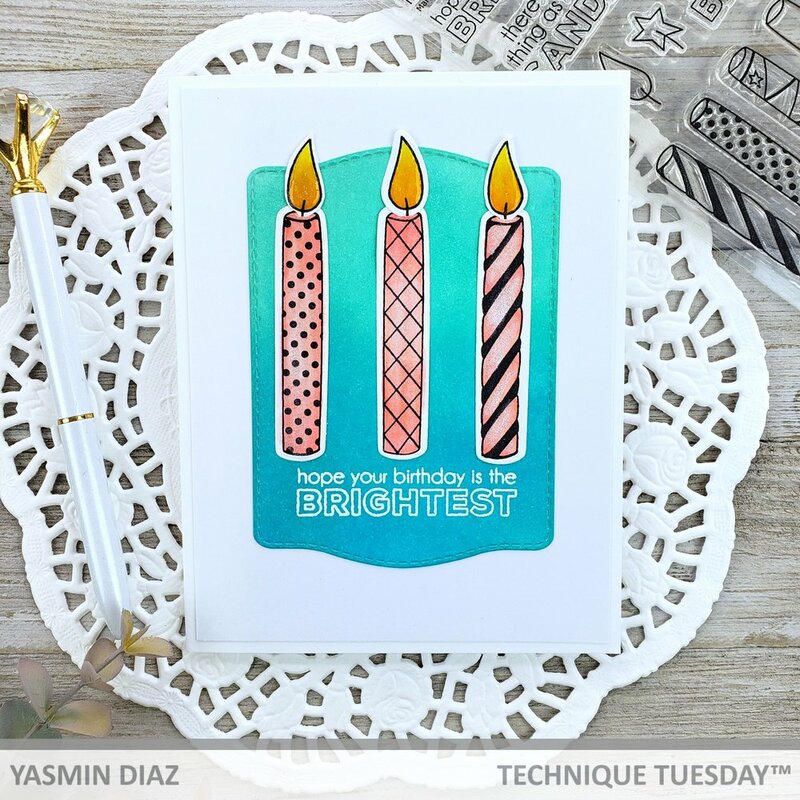 and to celebrate everyone here at Technique Tuesday want to wish you a Happy Virtual Birthday! Since we don’t know when your birthday is, Technique Tuesday celebrate everyone’s special day in late March with a once-a-year special offer, because there isn’t a birthday celebration without a gift right? So in celebration Technique Tuesday is offering you a 20% off your entire order. — Technique Tuesday Website you can click ➝ (HERE) for a direct link. — And use coupon code: HB2019 at the checkout for you to get the 20% off your entire order. 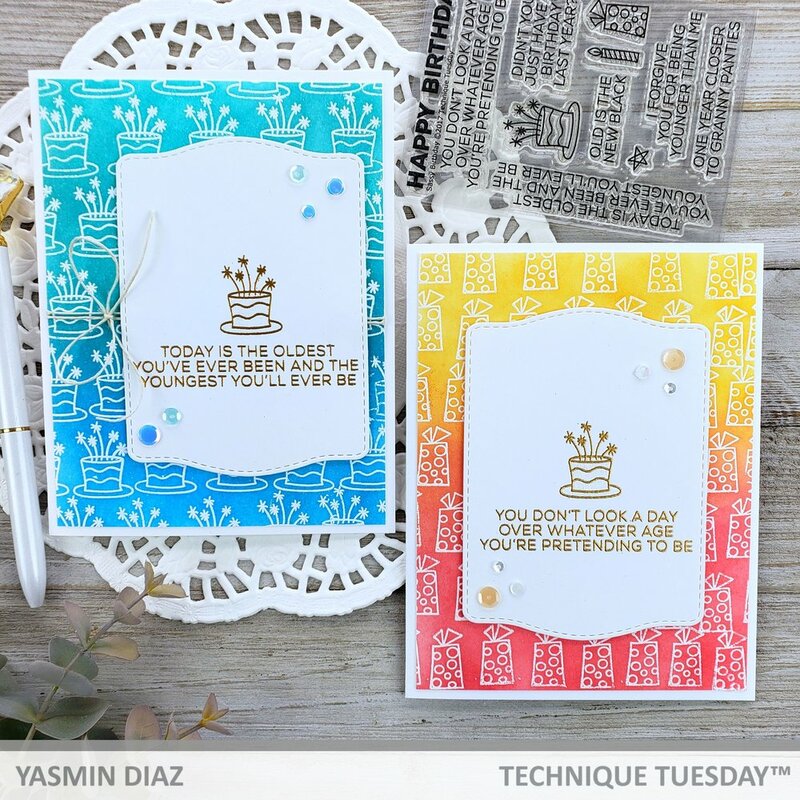 But… before you go I’ll like to share with you a little inspiration projects that I made for today’s blog featuring some of their Birthday selection of stamps and dies which they will be listing down below. That being said, let’s jump into the blog! Once the card panels were all inked up I set them aside, in the meantime I ran through the die cutting machine white card stock, and the biggest label from the Essential Stitched Dies 2X because I wanted to gold heat embossing a sentiment for the cards. For the first card layout I adhered foam mounting tape as I wanted to add a little bit of dimension between the label, and the card panel. Before I adhered the label to the card panel I wrapped around twice a big piece of hemp cord that I finished by tying a bow on one of the sides. Shortly after, I adhered the label to the card panel, and last but not least I adhered the card panel to the white side folding card base. As a finishing touch I adhered a few sequins here and there for a touch of sparkle. For the second card layout I skipped the hemp cord as you can see in the picture above. Because I wanted to created a different version from the first one. So for this card I adhered the label right in the center of the card panel, then I adhered the card panel to the white side folding card base. And to finish it off I adhered a mix of clear & peachy color sequins. 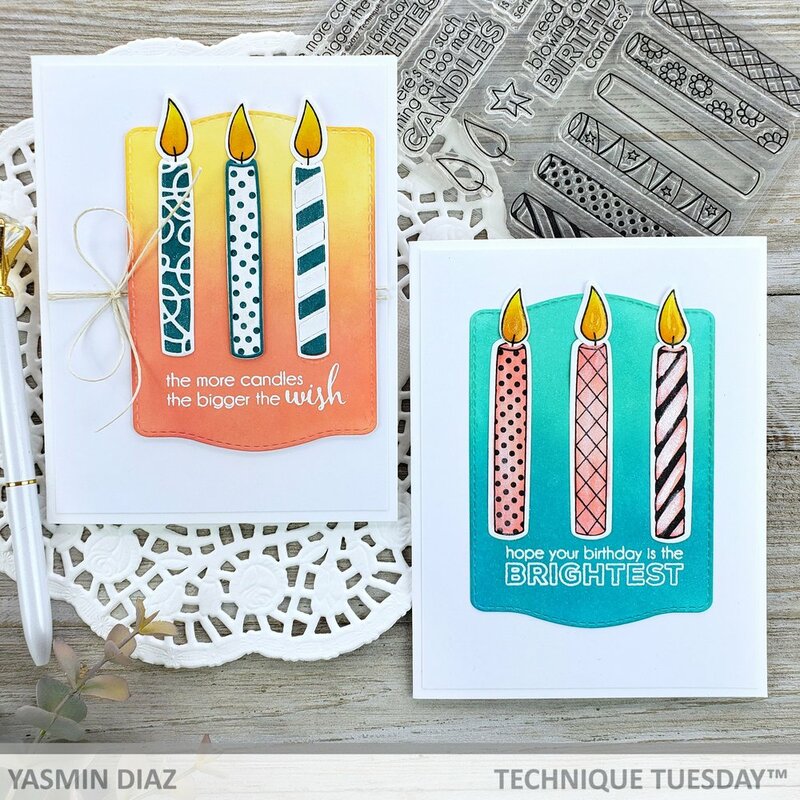 For the second example I used the Many Candles Stamp & Crafting Die set. For these card I did a minimal copic coloring for one of the cards. And for the other I did an easy die cutting by using the crafting dies to make the candles. Once the big label was inked up I set it aside. In the meantime I die cut out teal card stock the solid part of the candles, as I was going to layer them with the white outlines that I die cut out white card stock using the outline dies from the set. Them I colored with a combination of yellows the flame of the candle with the following copic markers. — Y13, Y15, Y17 that I had stamped with copic friendly black ink. Once I was done with the coloring, I adhered the outlines of the candles to the solid part with liquid glue, Next I adhered to them their flames by them the ink blending was dry, so I white heat embossed one of the sentiments from the stamp set. Shortly after I was done with the heat embossing I repeated the same steps as the previous example for the card panel, and I adhered the card panel to the side folding white card base. Last but not least, I covered the candles, and the flame with shimmer by using the Aqua Shimmer Pen, and as a finish touch I covered the flames with Glossy Accent to give them a touch of shine. Once the ink blending was done, I stamped the candles, and the flames from the stamp set in a piece of white card stock with alcohol friendly black ink, as I was going to use alcohol markers to color them. For the candles I used the following colors: R11, R22, and for the flames I used the same yellow combo as the previous example. Once I was done with the coloring I used the coordinated crafting dies to die cut them. After the die cutting piece were done, I adhered them to the label, and I white heat embossed one of the sentiments from the stamp set. Shortly after, I adhered the label in the center of a white card panel, then I adhered the card panel to a side folding white card base. Last but certainly not least, I added shimmer to the candles, and their flames by using once again the Aqua Shimmer Pen. And to finish it off I added Glossy Accent to them. Hooray you made it to the end! I hope you had a great time here with me, and I hope you get inspire by the birthday cards that I shared today. Down below you’ll find the supply list. I am creating this blog with the purpose of sharing how I design my cards, the information provided here is base in my own opinion and creativity. I am not an expert by any means, and I only share the way that I design my cards. The products shared and mentioned in my blogs are simply because… I use and truly love them. Most of the products used for my blogs are personally purchased by me. However, I did receive the Stamp and the Crafting die sets from Technique Tuesday.